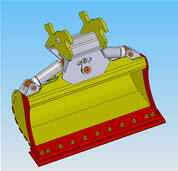 Javelin SolidWorks Heavy Equipment Industry Success Story - Craig Manufacturing Ltd.
/ Home / Customer Success / Success Story A-Z Listing / Craig Manufacturing Ltd.
Craig Manufacturing are a manufacturer of attachments for heavy equipment including; motor graders, loaders, excavators and dozers. Their customers are based throughout Canada and the United States. Company Name: Craig Manufacturing Ltd.
SOLIDWORKS design capabilities substantially reduced amount of product grinding and welding required. Anticipate 30% cost reduction related to development process in one year’s time (have not experienced a full product cycle yet). Craig Manufacturing is as impressed with Javelin Technologies, as we are with SOLIDWORKS. The combination of a good product backed by this level and quality of service sold us. Within our own company, I’m aspiring to implement Javelin’s level of service, presence and professionalism. Mark Stairs, Engineering Supervisor, Craig Manufacturing Ltd.